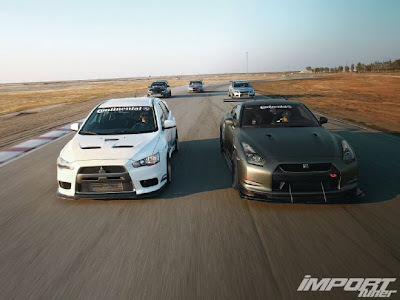 Import Tuner Magazine takes the big three Japanese performance all wheel drive cars, and pits them head to head in a 10 car, knock down drag out fight at Buttonwillow 13CW. Rather than just do the same Evo vs STI challenge they have done the last few years, this time they decided to throw the Godzilla in the room into the mix. Aside from the typical STI versus EVO shootout you’ve witnessed over the years, the Mitsubishi camp has been dominant, winning three out of the last four events and hardly been challenged by their boxer-powered rivals. This event marked the fifth consecutive year of competition but before the green flag droped, we made some dramatic changes to the event that would take an interesting turn. To bring back the event’s competitiveness, we threw a monkey wrench into the works and introduced Nissan GT-Rs as the newest competitors to join the epic battle. That’s right. We pitted Nissan GT-Rs against AWD Mitsubishi EVOs and Subaru STIs to see which vehicle was the performance king. After a long day’s event of grueling racing the final numbers were tabulated and the awards handed out. Taking home both the day’s fastest lap and Five-Lap Battle category honors was ACG’s 625 hp, satin gray ’09 R35 GT-R with a best time of 1:58.003 seconds. Yamada took Second Place honors in the fastest one-lap session with a 1:58.522 in the Fuji Auto ’00 R34 GT-R V-Spec. 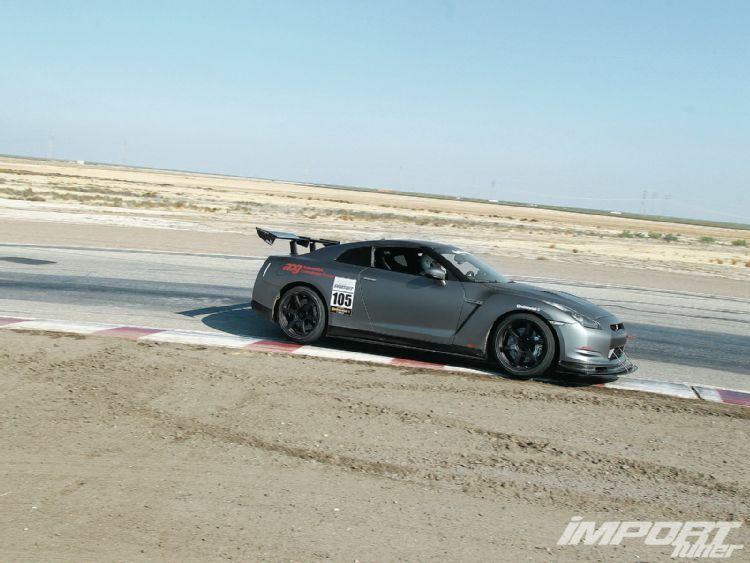 Team Mitsubishi stood toe to toe with the GT-R family as the camp’s top contender was Michael Chang who recorded a 1:58.891 lap time in the Kontrabrands/Evasive Motorsports ’06 EVO IX SE, which ended up rounding out the top three positions. The winning car had a Switzer P800 kit installed by ACG. Head over to Import Tuner for the entire article and pictures.